Victorinox Knife Set: A Cut Above The Competition? 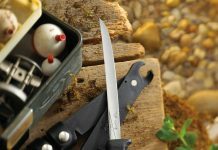 Home Food Prep Life Victorinox Knife Set: A Cut Above The Competition? A Victorinox knife set is a thing of beauty. Deciding to invest in a decent set of knives is the easy part. It’s the sheer variety available that causes a world of confusion. There is no manual out there that tells you what you should expect in terms of value for the money. That's when you get lost in the online marketplace. Spoiled for choice and wondering what really is a good price for a quality set of knives? Spend too little, and you sacrifice quality. Spend too much, and you risk burdening yourself with a complex array of professional knives doomed to gather dust atop the kitchen counter. A Victorinox knife set cuts to the chase by offering their customers a happy middle ground between quality and affordability. Way back in 1884, a Swiss entrepreneur by the name of Karl Elsener decided to open a factory in the tiny village of Ibach some 25 miles south of Zurich. His design for a compact knife that offered a variety of practical functions was revolutionary. These Swiss Amy Knives — as they came to be known — became something of an icon. Recognized world over for their unique design, it was Victorinox's commitment to the crafting of artisan-keen edges made from the highest quality steel that set them apart from the competition. The company – run today by Elsener’s Grandson, Carl — continues to observe their founder's four principles of craftsmanship: quality, functionality, innovation and iconic design. Over the many decades of the company's existence, they have expanded their range of products. Today a Victorinox knife set is considered almost legendary, as it is the product that kick-started the whole enterprise. 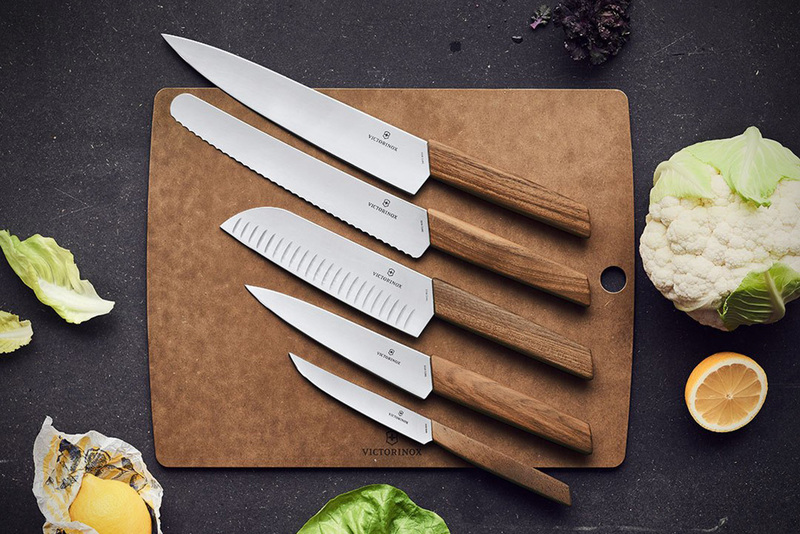 With over 134 years experience in the production of premium steel household and professional knives, a Victorinox knife set is a guarantee of quality like no other. 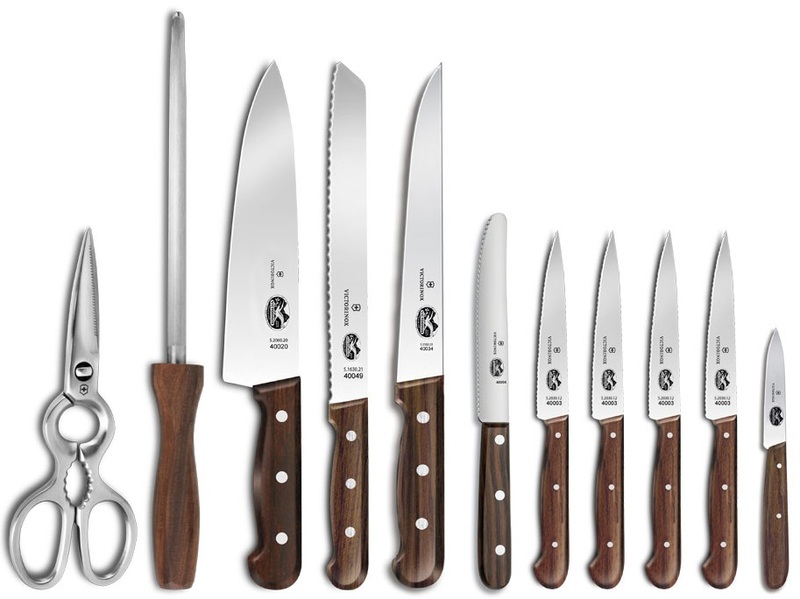 Your typical Victorinox knife set comes divided into two broad categories: household knives and professional knives. Such categorization is somewhat self-explanatory, but as is always the case when making a consumer decision, the devil is in the details. As the name implies, household versions of a Victorinox knife set see use in everyday non-commercial settings all around the world. 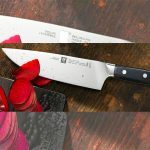 Packaged together in up to six types – a cleaver, as well as bread, boning, chef’s, carving and pairing knives – such sets generally sit in wood blocks atop the kitchen counter. 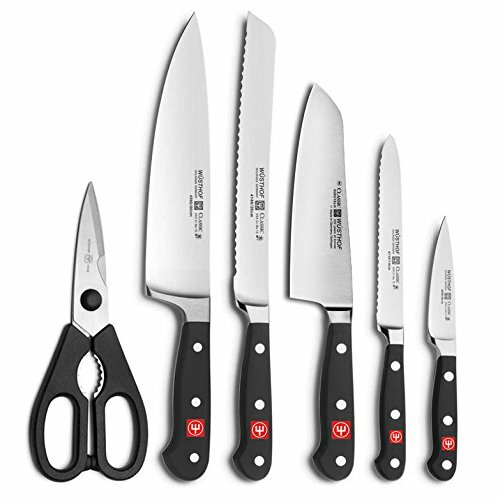 A professional Victorinox knife set is one step up from its household brethren. Such knives — designed with a long service life in mind — are of the very best quality. Still, one does not have to be a professional chef to make use of such exquisite blades. In the world of high-end cutlery, the word "professional" is synonymous with the word premium. Of course, quality comes at a premium price. A Victorinox knife set from their three-piece Grand-Maitre line is going to set you back somewhere around $350 to $399. The tempered edges of a professional Victorinox knife set are not an insignificant purchase, and those willing to part with a few extra dollars in the pursuit of excellence would do well to consider investing in such quality. Traditionally, chefs store their knives in rolled up canvas bags for ease of transport. But countertop wood blocks for professional-quality knives are increasingly common these days. Regardless of the type of Victorinox knife set, you choose to purchase there are commonalities between the various categories. It’s important to keep in mind the kind of knives you are likely to use. Pescatarians, for example, might not want to invest heavily in a set of Victorinox steak knives. In a similar vein, dropping money on blades that you have no use for is the very essence of redundancy. 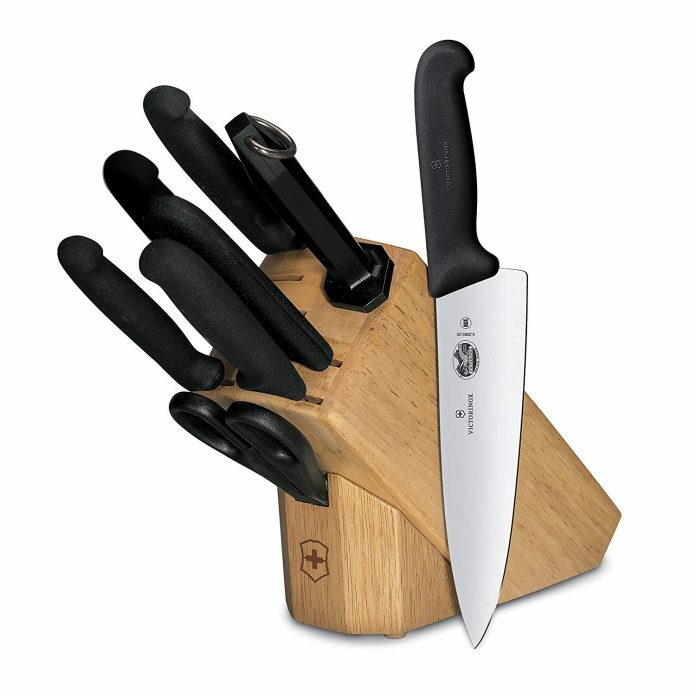 A standard six-piece Victorinox knife set such as the $350 to $400 Swiss Modern Cutlery Block, for example, offers a steak, kitchen, santoku, carving and bread/pastry knife. Meanwhile, the eight-piece Swiss Classic Cutlery Block – retailing at $250 to $300 – throws three different pairing knives into the mix but sacrifices the inclusion of Kitchen knife. The lower price point of the eight-piece set reflects the use of plastic handles as opposed to the walnut used in the six piece. The Rosewood Cutlery Block -- an eleven-piece Victorinox knife set -- promises to meet most kitchen needs with the inclusion of a potato peeler, sharpening steel and carving fork. With a price tag of around $350 to $400, however, a sacrifice of quality in favor of quantity is inevitable. Again though, the devil is in the details; the quality is still set remarkably high just perhaps not as much so as the more focused products within similar price ranges. Of course, not all Victorinox knife sets focus on general purpose usage. Classic steak knife sets start at around the $30 to $45 range for a six-piece collection. But higher quality options are available. 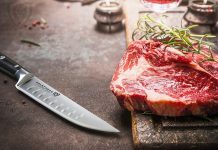 Indeed, Victorinox offers several two-piece steak knife sets ranging from the $130 to $150 Grand Maitre to the more affordable – but still exquisite – Rosewood Set something of a steal at $65 to $80. Other available options include the Grand Maître Cutlery Block that sports a set of high-quality kitchen shears and an entry-level utility block retailing for $49 to $69. A classic three-piece paring knife combo for $14 to $18 completes their budget line. The dimensions of any Victorinox knife set is one of those things that is going to vary from item to item. Still, some variables can be easily categorized. Chef’s blades, for example, start at 4.3 inches, in length. These short-bladed knives are best suited for specific tasks such as the 4.3 inch Classic Cheese and Sausage Knife or either of Victorinox’s 4.7 inch carving knives. In the mid-size category are the carving and filleting knives which includes the 8 inch extra-wide Fibrox® Pro Carving Knife and the similar sized Swiss Classic Filleting Knife. Among the longest blades available in a Victorinox knife set are the 10 and 12-inch slicing knives, and either of 2 salmon knives which retail for $65 to $71 and $78 to $86 respectively. Of course, just as blade lengths vary so to do the sizes of the blocks. The top-end Grand Maître Knife Block measures 15.4 by 8.9 by 4.7 inches and weighs 95.2 ounces. This particular product though is far from the most compact Victorinox knife set even within the six-knife subcategory. Less expensive by some $200 to $220, Grand Maître Cutlery Block comes in at 14.8 by 8.9 by 4.7 inches. The inclusion of the multipurpose kitchen shears takes the weight up to 112.9 ounces. As you would expect from an established company such as Victorinox the craftsmanship they put into each blade results in overwhelmingly positive reviews. The Victorinox Fibrox Pro 3-Piece Knife Set, for example, received 5 out of 5 stars from 93 percent of those who took the time to review it. 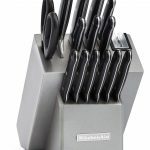 Meanwhile the Victorinox Fibrox 10-piece Knife Block Set – retailing at $209 to $229 – sits on 4.7 out of 5 stars with verified purchaser after verified purchaser lavishing praise upon the product. 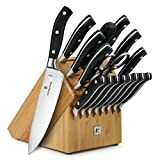 Some of the more expensive Victorinox knife set products – such as the Victorinox Forschner Forged Professional 18-piece Knife Block Set – have yet to attract user reviews. Still, with a price tag hovering between $1,050 and $1,199 it’s easy to see why online sales might be sluggish. 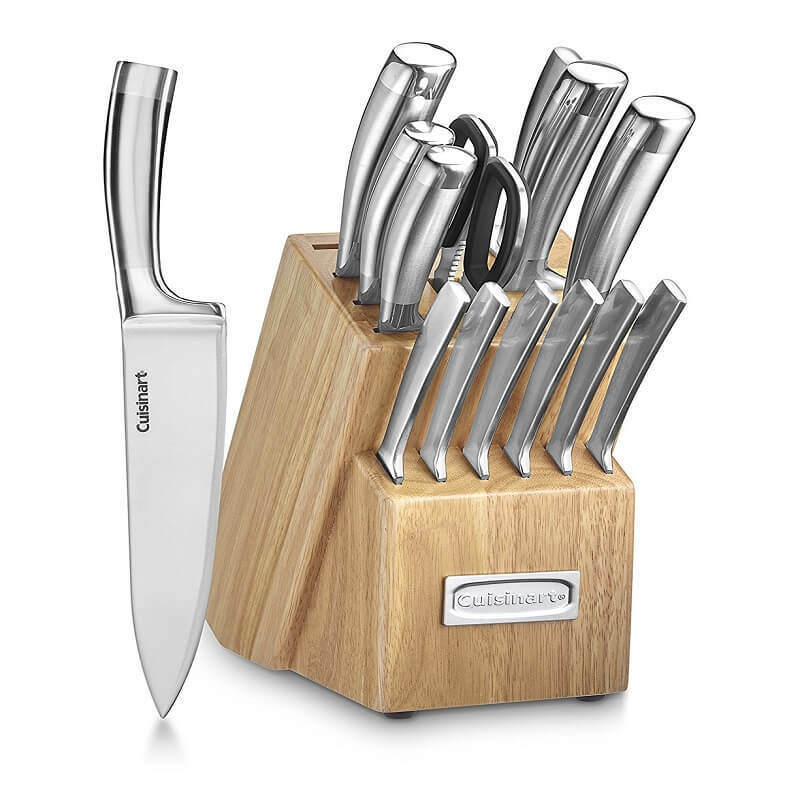 Even the expensive professional Victorinox knife sets receive excellent reviews. The Kitchen Guy, gave Victorinox products 5 out of 5 stars for usability and 4.5 out of 5 regarding value for money. Meanwhile, UK Business Insider listed the Victorinox 4-Piece Knife Set with Fibrox Handles as the best knife set on the market without a block. Pricing is another area where a Victorinox knife set is subject to fluctuations. Generally speaking, the pricing for a knife set starts at $100 and keeps climbing until it hits the $2000 mark. As a rule of thumb, many knife sets under $100 tend to be of poor quality. Of course, such an observation comes with a caveat. A 7-piece knife set for $120-$135 is probably going to feature blades of inferior quality to a 2-piece set retailing for $90-$100. At any rate, disregarding the sub-$100 knives leaves us with a range that begins around $110 to $120 for a 3-Piece Rosewood Flat Set and continues to climb all the way to a $650 to $700 Grand Maître Knife Block. The latter product represents the upper end of the mid-range, but prices can get even steeper for the true knife enthusiast. 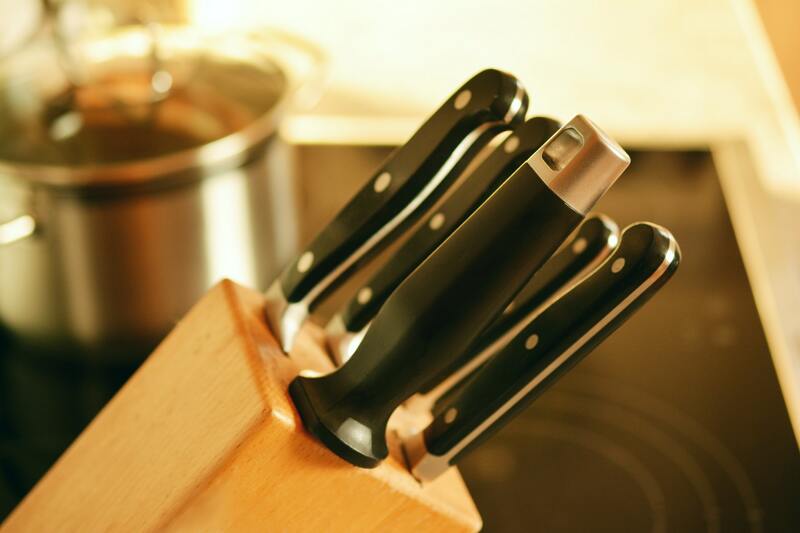 Three main factors affect the price you are going to pay for a Victorinox knife set. The first factor – and perhaps most obvious – is the number of knives included in the collection. 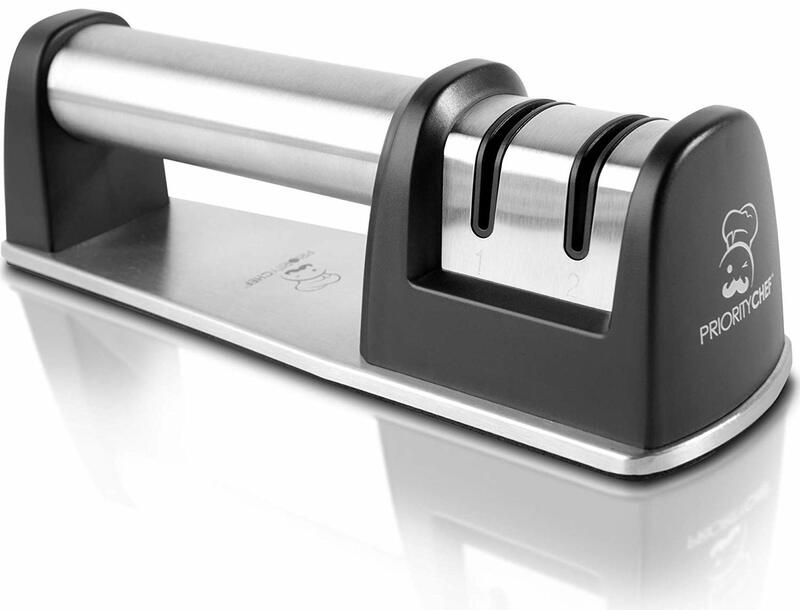 For a knife block set, six and seven blades are something of an industry standard. Victorinox however, does make blocks that come bundled with no fewer than eighteen blades. As a rule of thumb then, when buying a Victorinox knife set try to ensure that you spend at least $45 to $50. At such a price point quality is more or less guaranteed. The handle of a knife performs two functions one practical and one aesthetic in nature. The choice of material naturally has an impact on the price of any Victorinox knife set. 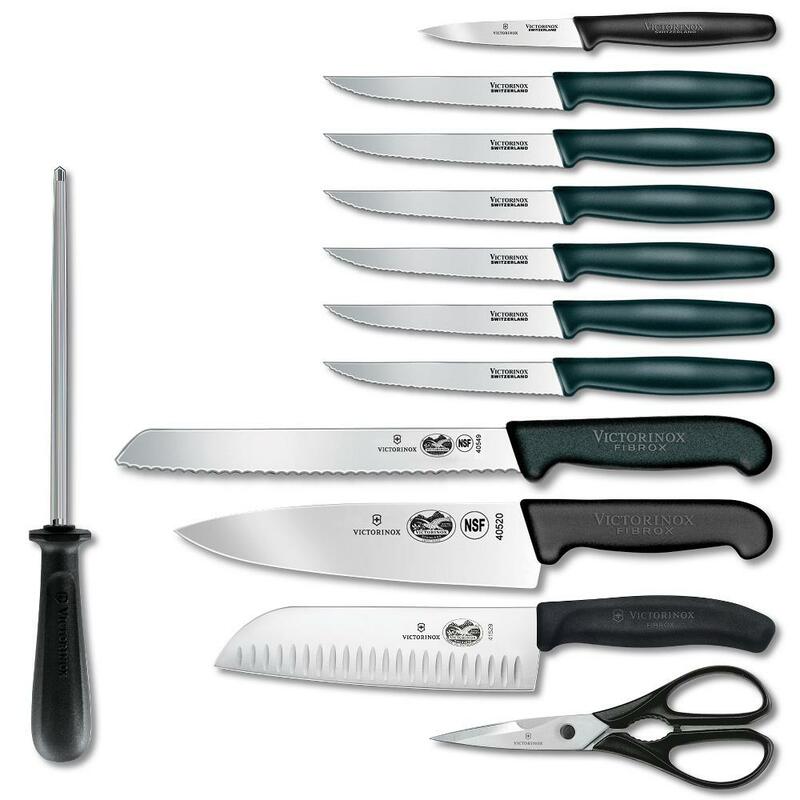 Low-end Victorinox knife sets veer towards using either a polyoxymethylene (POM), or polypropylene (PP) handles as standard. Often set in bright colors their functionality rarely raises itself above adequate. They are aesthetically pleasing though (assuming you like that kind of thing). Higher quality handles by Victorinox feature a carved Rosewood or Beech finish. Both materials are gorgeous and are a sure sign that you have in your possession a superior quality knife. With aesthetics mostly down to personal taste, it's fair to say that the finished wooded handles sit comfortably above the expectation curve. The blade itself is the star of the show. That the most expensive component of any knife is at the business end is a surprise to nobody. When it comes to raw materials, steel is not necessarily the most costly component of any knife. It is the craftsmanship that goes into creating the blade that drives the cost up. As a consequence, the more protracted the edge, the more expensive the knife is likely to be. And that's a variable that cuts across pretty much every price bracket. In taking a close look at Victorinox knife set, we examined dozens of user reviews. These reviews covered the full range of the company’s products. We took note of what people are saying about these and other-brand blades. We based our score on an aggregate of observations from verified buyers. First, Victorinox has many competitors. Let's take a look at the best. In the world of well-crafted cutlery, Wüsthof is one of those names that crops up time and time again. Founded in 1814 in Solingen, Germany they have a pedigree that outmatches even Victorinox. To be sure they make some fine blades. 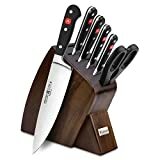 The Wusthof Classic 7-piece Slim Knife Block Set in walnut sits on an Amazon rating of 4.7 out of 5 stars. 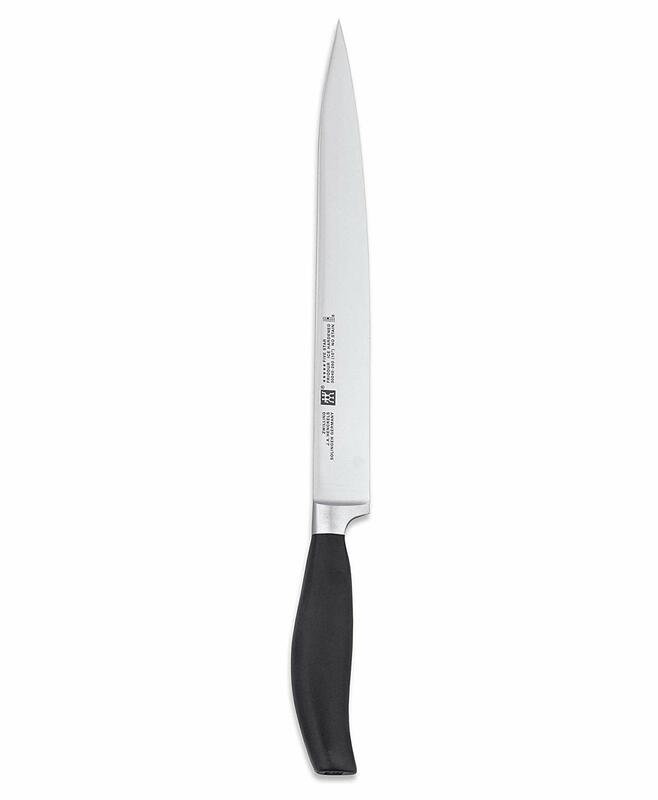 Their Grand Prix II 10-Inch Cook's Knife has a rating of 4.8. Such high praise, however, comes with a catch. Wüsthof is a tad on the pricey side. That Cook’s knife is liable to set you back somewhere around $129 to $139 just by itself. 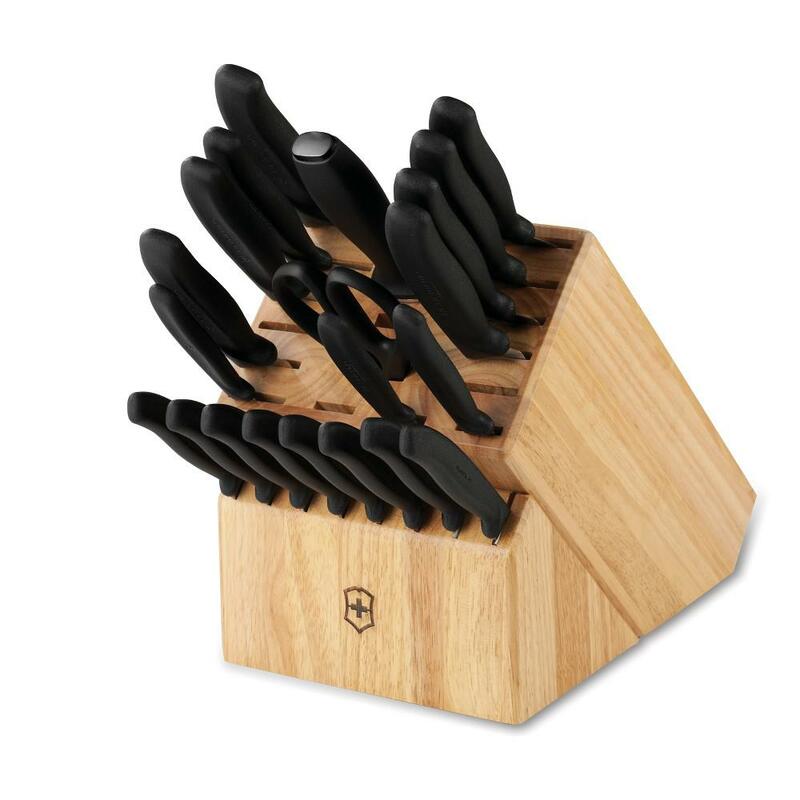 Their Classic Ikon 26-piece Ultimate Knife Block Set comes in at a cool $2,100 to $2,299. ​A little hard on the bank balance. Cuisinart is probably best known for their brightly colored kitchen knives, but there’s much more to their product range than that. Their affordable line of stainless steel hollow handled knives is worth a look. Prices start at $50 to $60 and go all the way up to $120 to $129 for their Professional Series 15-Piece Cutlery Block Set. Quality here is of course relative. While these are entirely unable to compete with the prestige and expertise of a Wüsthof or Victorinox knife set, for the price the quality is surprisingly good. Another knife company with a Germanic heritage, Zwilling J.A. Henckels has been around for so long that the company predates the birth of the American nation. Formed in 1731 just a stone's throw away from principle rival Wüsthof, they quickly developed a reputation for quality that continues to this day. Their best knives feature blades made from a closely-guarded secret form of high-carbon steel. Pricewise these blades are as you would expect. People have been known to pay $2,800 to $3000 for a single knife, and although most of their products are cheaper, by comparison, they are nonetheless on the pricey side. Full sets for around $500 to $579 are readily available and are -- frankly – gorgeous to behold. ​Some blades are not dishwasher safe. Victorinox Knife Sets: The Good. The Bad. The Not-So-Ugly. The adage that you get what you pay for is especially applicable to kitchenware. Like many companies, Victorinox capitalizes on its good name to provide entry-level products for consumers interested in dipping their toes in the world of quality cutlery. There, at the bottom end of the product range, you’ll still find a high degree of craftsmanship. A $30 knife from Victorinox is likely to be better than a $30 knife from elsewhere. Thanks to the 140 or so years of experience they’ve had producing knives they are more than up to the task of combining quality with affordability. But it is at the upper end of the scale that Victorinox gets to show its true colors. Magnificent designs combine with quality steel that can go toe to toe with the best manufacturers in the world. The prestige of the brand, the contours of the blades. Those prepared to invest a few hundred dollars into a Victorinox knife set are unlikely to regret the decision. ​Well-known brand with a reputation for quality. Which Knife Is Best For You? Ultimately the type of knife set you'll want to purchase is going to come down to personal choice. Some Victorinox knife sets are of such superior quality that they slide easily into the heirloom category. Such blades are treasured possessions and unquestionably purchases for life. For most though, a price tag of over $1000 is going to be a touch on the lavish side. It is in the mid-range then that Victorinox shines. Their range of professional knife sets hovering somewhere in the sweet spot between $400 and $800 offer world-class craftsmanship at the kind of price that only makes you wince for the briefest of moments.